While in Sacramento for a mystery convention over the weekend, I couldn't resist visiting the Old City Cemetery. The cemetery was established in 1849, the year California's gold rush began. It's Sacramento's oldest cemetery, and has some beautiful stone carvings. 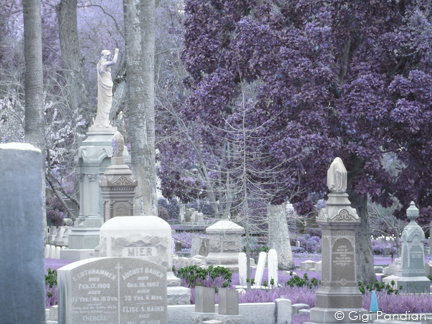 The day I visited, the weather was dramatic, so I thought I'd try some infrared photo effects of the cemetery. 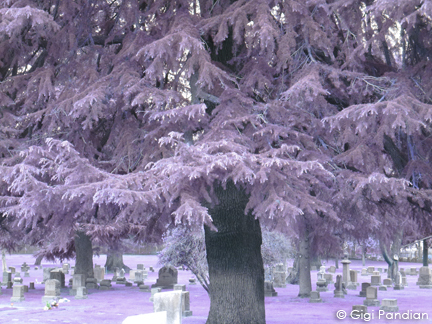 Infrared photography picks up a different spectrum of light from normal photography, so it's great for creating dramatic images. I first became interested in infrared effects when I was intrigued by the castle photography of Catriona Fraser. Now I'm toying with the idea of turning my old digital SLR camera into a digital camera that will shoot infrared. For now, I'm doing a combination of using an infrared filter on my camera lens and playing around with Photoshop effects. 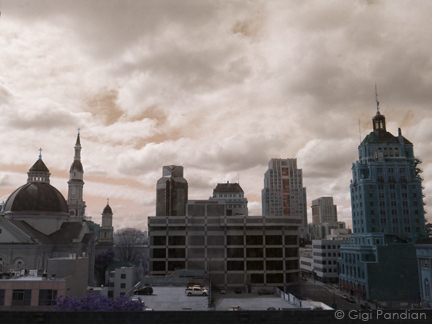 This last photo below isn't of the cemetery, but is a view of the dramatic sky outside my hotel window.